Cooling towers are a vital part of many commercial HVAC systems. 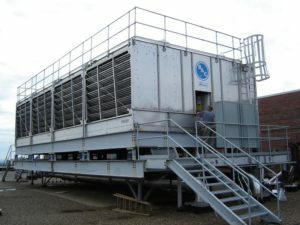 However, when you hear about the importance of commercial HVAC preventative maintenance programs, often, the narrative revolves around rooftop or package units. Unfortunately, as a result, cooling tower maintenance and cleaning are often improperly performed or for that matter completely neglected by many facility managers. This lack of proper maintenance, including regular cleaning and disinfection, can cause major issues that can significantly reduce the lifespan, reliability, and efficiency of the equipment. These consequences can result in serious financial impacts on your business and can even affect the health of those within and around your facility. During routine operation, cooling towers continuously scrub bacteria, dust, pollen, insects, and other debris from the air. Without a proper cleaning and disinfecting program in place, during periods of non-use such as the winter months, the cooling tower becomes a breeding ground. The buildup of bacteria and debris along with stagnant equipment conditions combine to form an ideal environment, assisting in the development of biofilms, or slime, which can infest an entire HVAC system. Due to the infestation of microorganisms, which biofilms are comprised of, a wide range of problems can ensue including clogged piping and reduced heat transfer efficiency, which we’ll discuss later, along with the development of Legionella bacteria that causes Legionnaires disease. When warm water from the system is cooled, vaporized, and released by the tower, that moist air can carry the Legionella bacteria far and wide. That means even people at street level can inhale the bacteria and become ill from it. In early July 2018, an outbreak of Legionnaires was identified in the Upper Manhattan area of New York City. The outbreak sickened 23 people and killed one person. Legionnaires is serious – 5% of people who are exposed to Legionella become sick and anywhere from 5% through 30% of those cases turn fatal. In fact, Legionnaires is a large enough threat that New York State and New York City both enacted strict cooling tower cleaning regulations to curtail the disease. These regulations include very specific cooling tower cleaning and maintenance measures designed to protect public safety. It is important to catch this process very early as removing biofilms can turn out to be a rigorous and costly process. They are very difficult to completely eliminate even when subjected to high levels of chlorine or other disinfectants. Because of all of this, The United States Occupational Safety and Health Administration (OSHA) Technical Manual recommends cooling tower cleaning and chlorination should be performed a minimum of twice a year. More frequent cleanings may be required if an inspection shows the visible presence of microbiological growth or an excessive buildup of debris. Additionally, systems that have been out of service for an extended period should be cleaned and disinfected before startup to significantly reduce Legionella risks. If a cooling tower’s water is not cleaned regularly and in the correct fashion, studies have shown that the cooling tower’s efficiency can be reduced by as much as 40% – 50%. If not properly maintained, the bacteria, airborne dirt, and debris deposits collect and affix to different components of the cooling tower. This restricts air flow, forcing the fans and pumps to operate longer and harder to maintain the desired water temperatures. If water temperatures are allowed to increase by even as little as 2-3 percent, the return water from the tower will cause the chiller to work longer and harder. All these inefficiencies add up to take money out of your energy budget and can result in a loss of cooling effectiveness for your customers and your employees. Not only will the increased workload on the cooling tower’s components eat away at your bottom line from an energy standpoint, the chances for equipment failure increases, and the expected lifespan of the parts and entire unit decreases. While the process of cleaning and disinfecting a cooling tower can be arduous and labor intensive, the payback can be significant over time. If you currently do not have routine maintenance performed on your cooling towers, contact a professional. When you do, make sure to ask about their experience with cooling towers and get references. With the number of cooling tower savvy technicians decreasing across the country and the risks involved with improper cleaning, you want to make sure you are getting the best service possible.